Leeds Anarchist Black Cross have produced a leaflet on the case of the Welling incident, the trial of the anti-fascists and their imprisonment. You can view it here. 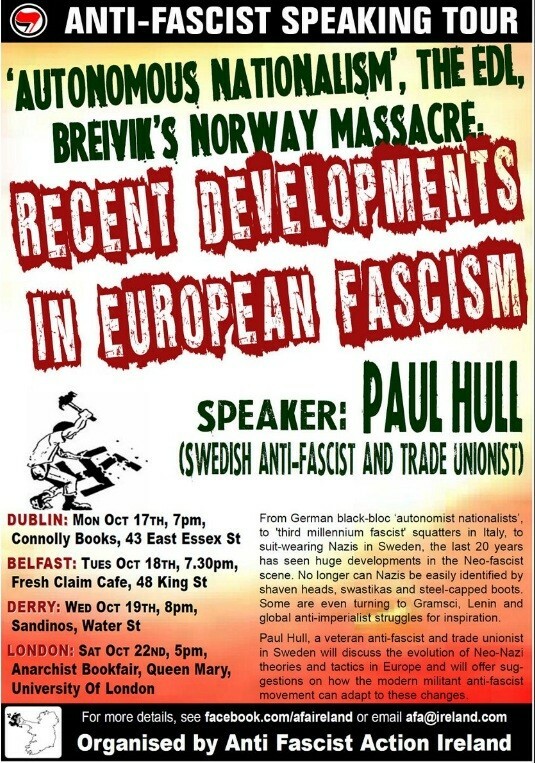 Our comrades in Anti-Fascist Action Ireland are hosting a speaking tour by veteran Swedish anti-fascist, Paul Hull. Whilst most of the dates are over in Ireland, you can see Paul speak at the London Anarchist Bookfair on Saturday 22nd October. On the 20th October, Nick Griffin of the British National Party is due to speak at Trinity College in Dublin. We wish our comrades the best of luck with whatever they do that day and with the rest of the speaking tour. See the poster below for more information. Today marks the 75th anniversary of the Battle of Cable Street, the day when East End anti-fascist, Irish, Jewish, anarchist, communist and socialist groups united to block the march of Oswald Mosley and his British Union of Fascists. Hundreds of thousands of locals gathered, blocked the path of the march and fought running battles with fascists and the police who were drafted in to clear the march route. This use of mass community direct action was hugely successful and the march was eventually abandoned. Around 175 people were injured, and about 150 were arrested. On Sunday 2nd October over 1,000 people took part in a commemoration march in London. When confronted by a swaggering neo-Nazi at Welling train station in March 2009, Sean Cregan did what any good antifascist would, he put the Nazi on his arse! While twice Sean’s size, one punch was enough for the scumbag fascist, who dropped to the ground as if pole-axed. His neo-Nazi companion quickly fled down the station platform, with Sean in hot pursuit. The two scumbags had been on their way to a so-called “Blood and Honour” gig, which are regularly held at the nearby Duchess of Edinburgh pub (with the active participation of the fascist landlord with whom the two were to stay). When questioned by police later, the first fascist gave his name as Patrick O’Donovan (this may be a false name since he is German and came over specifically for the gig, which are illegal in Germany). His brave companion gave his name as Michael Heihl. There had been several unrelated incidents at Welling Station that evening, and the police arrived quickly, arresting several antifascists who were also at the station (or in the vicinity). Some months later, dawn raids took place around the country, with large numbers of cops smashing in doors and arresting other antifascists. Draconian bail conditions were imposed. In total, 23 people were now under arrest in relation to the punching of ‘O’Donovan’. Since there was no available ‘complainant’ in the case, the cops – the British Transport Police led by Detective Inspector Sam Blackburn – were unable to charge Sean, or any of the other antifascists, with assault. Instead they were charged with ‘Conspiracy to Commit Violent Disorder’. In legal terms, ‘Violent Disorder’ occurs when a person’s behaviour is deemed to be of such a nature that it would cause alarm or distress to someone witnessing it, though in this case nobody had complained and it was ruled that there was not sufficient evidence to additionally charge any of the antifascists with ‘Violent Disorder’ itself. Charges were dropped against one of the antifascists, a young woman, in the early stages, but because of the sheer number of defendants the Crown Prosecution Service (CPS) argued that, for logistical reasons, it was necessary to split the defendants between two trials. Of course this also put the Prosecution at a considerable advantage, particularly as they would be prosecuted by the same individual – Mark Trafford. Both trials would be held at Blackfriars Crown Court before Judge H.O.Blacksell. The CPS chose to first prosecute not so much those with the most evidence against them, since they have presented no evidence of a conspiracy throughout, but those whom they judged would be most easily convicted. Many of the defendants had been convicted of political activities in the past, and because of these ‘prior convictions’ could not present character evidence in their defence for example. The CPS knew that they could rely on the prejudice and ignorance of the jury (one of whom sported a shirt emblazoned with a large St George’s cross) for some convictions, and sure enough seven antifascists were convicted as charged, with six of them being sent immediately to jail. As our comrades were sent to prison, the architects of the fit-up were busy congratulating each other. Blacksell, the judge who presided over the charade, said he would be recommending Detective Inspector Blackburn for a commendation – For what, making travel safer for Nazis?! Perhaps Blackburn will get the ‘Iron Cross’! This whole case revolves around one neo-Nazi, who was not a complainant in the case, being put on his arse. For that 23 people were arrested, hundreds of cops were involved in dawn raids, and two show trials were held costing Millions, what a great service to the ‘public’! But of course, this case is about far more than one pathetic fascist. Immediately before the second trial, charges were dropped against two more of those previously accused of being involved in the ‘conspiracy’, leaving nine more to face trial. The trial began on Monday 12th September, and once again the Prosecution presented absolutely no evidence of a ‘conspiracy’. The jury seemed nonplussed as to why they were there. Once again, the trial dragged on for more than three weeks. One of the things that came out in the second trial was that a racist Immigration Officer, who acted as a prosecution witness, and who in his police statement described Ravi Gill as having a “typical big Asian head” and “speaking Indian”, lied through his teeth in the first trial. 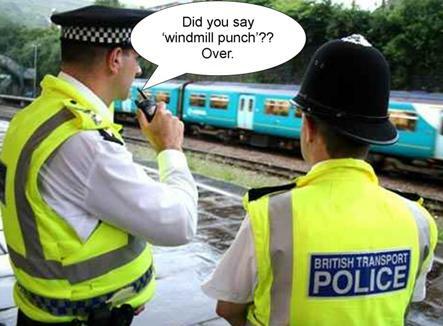 He could not have witnessed the incident as he claimed because when it happened he was not actually there, but outside buying his ticket! As his attempts to fit up the second group of antifascists began to unravel, Trafford became quite desperate, and at times appeared close to tears. He had pursued the case with personal malice and with a messianic gleam in his eye throughout, and his arrogance led to some verbal fencing with defendants of twice his intelligence which simply left him looking foolish. Bereft of evidence, he simply relied on being able to mislead and prejudice the jury as he had done in the first trial. To this end, Trafford tried to present the neo-Nazis of ‘Blood & Honour’ and the Anarchists and antifascists in the dock as two sides of the same coin, as if the Nazis and partisans of World War Two had some sort of moral equivalence. This morally repugnant position was rounded on by the Defence in the closing speeches with Trafford pilloried to an unusual extent. Putting the incident firmly in its political and historical context, one of the Defence barristers even went so far as to say that the jury should not only be acquitting the defendants, but thanking them for being prepared to confront organised fascism. It should be clear that this prosecution was brought to try and smash antifascist resistance (something Trafford has privately made explicitly clear) and to intimidate antifascists from engaging in any form of antifascist activity. The case however, and the way that the ‘conspiracy’ law has been used in it, has huge implications for activists in general, it is an attempt to outlaw any form of protest. Leeds ABC regard it as highly regrettable that the case did not have the massive publicity it warranted from the very beginning. The jury retired to consider the verdict at 3.00pm today – They were back again less than an hour later to acquit all nine antifascists, treating the prosecution case with the contempt it deserves. The courtroom erupted into cheers and cries of jubilation, with only the judge and prosecutor left looking sour-faced. Tonight as the acquitted and supporters retired to the pub there was every reason to celebrate. Tomorrow is the 75th anniversary of the Battle of Cable Street. We hope that readers will join us in raising a glass – to our comrades who triumphed over this judicial fit-up, to the antifascists down the ages who have been prepared to go out onto the streets to confront fascism, and to our six comrades who were fitted-up earlier this year and who deserve our fullest possible support. The six antifascists imprisoned in the first trial were originally held in Wormwood Scrubs prison in London, but five have now been moved to other jails in southern and central England. Please send them letters of support at the addresses given below. We expect Thomas Blak to be moved this week and his new address will be published on the Leeds ABC website when that happens. Thomas, who is Danish and has lived and worked in England for 15 years, is also under threat of deportation. The prisoners may each receive postage stamps and Postal Orders (made payable to ‘The Governor’ and with the prisoner’s name and prison number written on the back). 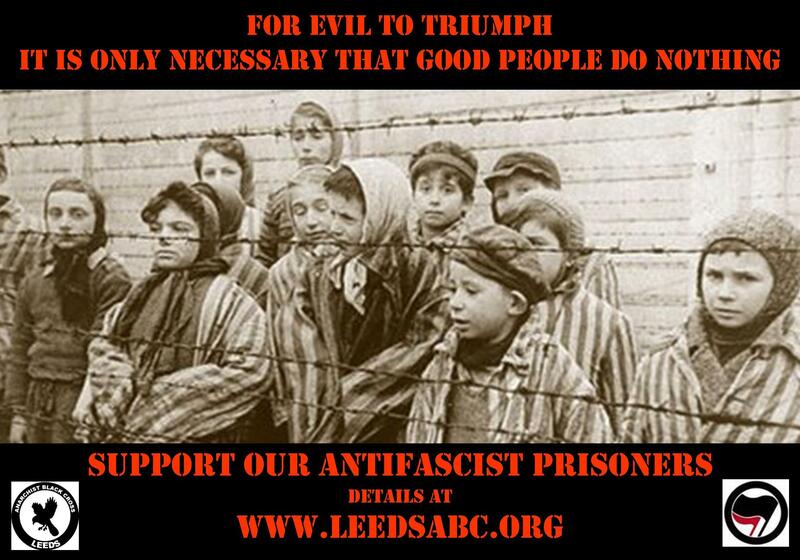 For advice on writing to prisoners please see the Leeds ABC website. We would like to thank the groups and individuals who have already contributed to the solidarity fund, including Antifa England, Brighton & Hove TUC Unemployed Workers Centre, Bristol ABC, Kate Sharpley Library , and Rebel Soul (Shambala Festival). The Anarchist print co-op Sabcat have also produced two benefit T-shirts in support of the prisoners. They are printed on organic cotton, fair wear, carbon neutral, Earth Positive T-shirts and cost £14.95 including UK postage. Sabcat are donating their labour for free, so apart from the cost of the unprinted garment itself and the postage, all money raised goes to the antifascist prisoners support fund. To order a T-shirt check out the Sabcat website. They will also be available to buy at this year’s London Anarchist Bookfair. Leeds ABC have produced a solidarity poster (see above) in several sizes, which is being displayed in laminated form in numerous community centres, social centres, pubs, cafes, bookshops, etc. Please contact us with regard to displaying one. You can also download the graphic to display on your website, Facebook page, etc. Last, but by no means least, a number of revolutionary solidarity actions have been claimed in the names of the prisoners, and we both appreciate and applaud these acts. We should remember that the very best act of solidarity we can offer is to continue to fight against fascism and not to be intimidated or cowed by these latest attempts to stop us resisting. Solidarity to the antifascist prisoners. For the addresses of the prisoners go to our prisoner support page.